One butchery in the Cotswolds has found success through its meat hanging techniques and breed choice. Laura Bowyer meets the farmer behind the business. 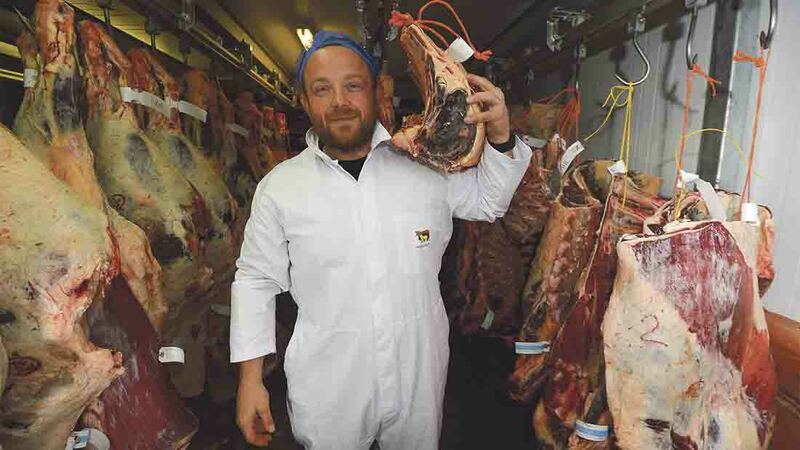 Traditional methods of butchery and native breeds are at the heart of Martin’s Meats business. Livestock, along with haulage, are deeply engrained in Martin Gilder’s family heritage. Thanks to his father Gordon, the name behind the 50 livestock lorries and 95 trailers can regularly be seen touring the UK, hauling livestock, machinery and other goods. After leaving school at the age of 16, Martin went straight to work for the family haulage and farming business. 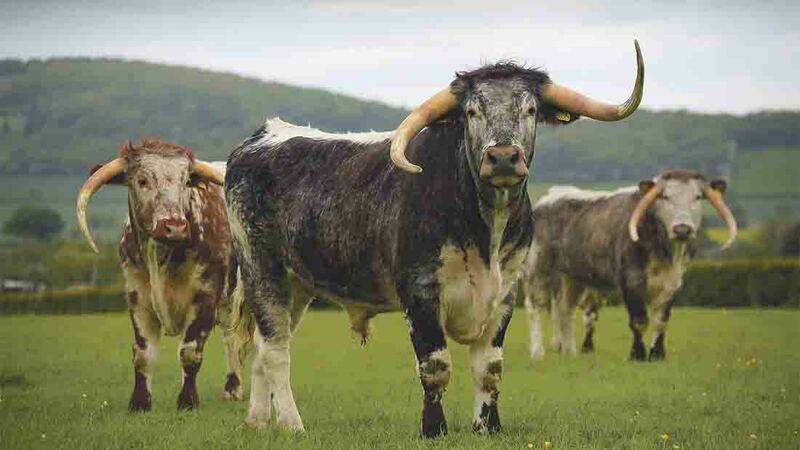 Soon after, he started buying cattle of all breeds from markets surrounding their Cotswolds home, including Gloucester, Worcester and Cirencester. He went on to drive lorries for the business, and spent three years travelling back and forth to France, hauling lambs on a weekly basis for Tesco. At home at Hill View Farm, Gretton, Gloucestershire, he was keeping 400 head of cattle, buying them in as stores and finishing them on waste foods. With his older brother Shaun involved in the business for five years before Martin returned, he was keen to carve out his own niche within the business. In 2003, a unit became available to rent on a neighbouring industrial estate, only miles from the family home, farm and lorry yard, so Martin made the move and took on the lease. Following this rental, the unit and the one adjacent were bought in 2007, and a partial grant targeted at diversifications was achieved from the Rural Payments Agency for the hanging rail and other infrastructure required in the cutting plant. Martin says there was a lot of paperwork and hassle involved in the grant application, but the money received equated to 40 per cent of the overall cost of kitting the butchery out. Today, Martin and his wife Emma run Martin’s Meats, turning over £2 million annually and employing seven butchers, three drivers to deliver orders and two office staff. The business processes and sells meat produced on-farm along with other bought-in meats. Maturing the meat holds a great deal of importance for the business, with pigs hung for one week, lambs for two and beef for a minimum of 28 days, although he leaves special requests for up to 50 days. Martin’s ‘dry ageing’ approach for beef is aided by a Himalayan salt chamber, a technique used in the business for the past two years and the only one Martin knows of in the South West and Midlands. The side of the fridge where beef carcases hang is lined with 2,500 brick-sized lumps of salt, sourced from Pakistan. The wall just inside the entrance to Martin’s Meats is adorned with Great Taste Award certificates, which have been received for quality tasted within the meat. In 2013, Martin had three products in the top 50 and won best product in the South West with his Longhorn cote de boeuf. Further success was achieved in the Great Taste Awards in 2014 and 2015, when he bagged 17 gold stars and once again showcased three products in the top 50. Martin says they were the only meat producer to achieve the accolade among the 10,000 products entered and he believes it is this proven consistency in quality which has really helped his business. There are three beef options customers can choose – Longhorns, traditional beef from the Cotswolds and UK beef, sourced from wholesalers and dependent on customer needs. Martin still keeps cattle at home and actively manages the herd alongside the butchery. And his plans are to continue expanding. He says: “I want to run the UK’s biggest herd of Longhorn cross cattle. I keep 120, including 30 breeding cows, but I am aiming to raise total numbers to 200. I believe this will play a great part in marketing the meat business. 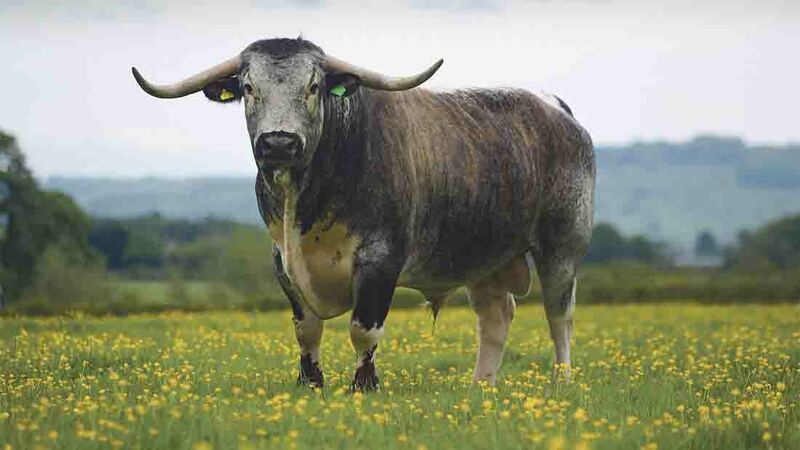 “Longhorns are renowned for their sweet taste and fine grain with good marbling and I favour traditional breeds to Continentals for these reasons. “They are also a traditional breed, being the oldest breed of cattle in the country, and are even mentioned in the Domesday Book. “We are in a good position for buying Longhorns here, as a good number go through Worcester market. We buy them in as stores, but we are not feeding food waste any more. The diet excludes the consumption of cereals, which is taken to the extent of also targeting cereal-fed beef, so Martin has consequently stopped feeding rolled barley to his cattle. He also keeps his own Texel cross lambs and gets some pigs from his brother-in-law. Additional lambs and pigs are sourced locally to make up the volumes required. All of Martin’s killing is carried out by P.J. King and Sons, Gloucester, which receives about 10 of his cattle each week. Martin describes them as an old-fashioned, traditional abattoir, and carcases come back to him very dry. He says: “In modern abattoirs, they wash the carcase, whereas in more traditional slaughterhouses, they wipe them, so we receive a dryer carcase, which lends itself to our dry ageing process. We like to think of ourselves as traditional butchers with a modern twist. Beef is not the firm’s only product, with Texel cross hoggets purchased from P.J. King and Sons. Martin says he likes to buy hoggets for their taste and size and they are also a bit cheaper, lending themselves to the restaurants. Pigs are locally sourced and are mainly Gloucester Old Spots, as well as some traditional crosses. Martin has a local supply of game, bought through dealers, shoots and deer stalkers. “No business like ours can say they are truly self-sufficient in supply. Carcase balance has been a problem in the past and we have been overrun with forequarter and having to freeze it in summer and use it in winter. Orders can be made online, with deliveries arriving fresh. However, most of Martin’s sales come through on the office’s answerphone from chefs made after service. Martin and his team process these orders for delivery when they come into work at 4am. More than 200 restaurants are supplied in the Cotswolds, Gloucester and the South West. 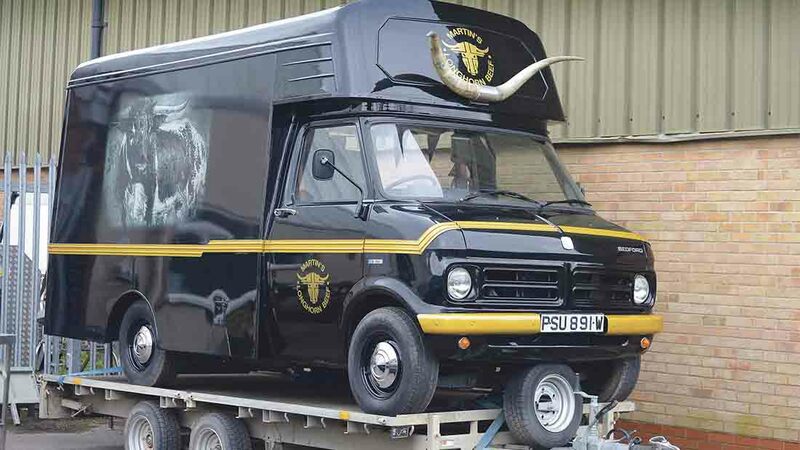 The festival trade is also something Martin is hoping to capitalise on this summer, with his newly renovated ‘beef truck’ costing £21,000, with its own pair of Longhorn horns attached above the windscreen. Moving forward, Martin hopes to expand his site, saying he has out-grown the current one. He says: “I would like a cutting plant and shop on-farm so people can come and see stock and what we do.